In the course of the major software update to Android 8.0 Oreo, Samsung has left many new Android features behind. Instead, it focuses on improving its Samsung Experience 9.0 user interface in a way that seems thoughtful and overloaded at the same time. Taking a completely naive look at the new Samsung software, let's see what we find. Samsung Galaxy S8+: is bigger better? Oreo is rolling out for the Samsung Galaxy S8 and our experience with the beta had already prepared us for the direction the update would take: Samsung Experience 9.0 will be colorful and feature packed. The changelog makes the extent clear: Samsung has followed though on what the beta promises. But are there any really impressive changes? I rediscovered some old feature gaps in Samsung's interpretation of Android and found some new ones. Compared to the fairly clean Android 8.1.0 on the Nokia 8, we discover a number of differences that make the user experience of Oreo on a Samsung device unqiue. Samsung includes many features for Android fans, as well as some that are missing from the competition. Samsung still refrains from using the Android 5 Lollipop feature introduced in 2014 to set up user or even guest profiles on smartphones. If you want to share the phone with a second person, you have to either fully trust them or switch to the limited window stapling. Luckily, if you use the multi-user feature for Facebook or WhatsApp duplicate accounts, you can still do that. Samsung offers an alternative with Dual Messenger. Unfortunately, Samsung itself determines which social media apps can be doubled in this way. Also, twin apps can't access your Google Account, so you need to create it twice. In the quick test, Slack, Threema and Telegram X were not an option with this feature, and I would not expect compatibility with services that have less than 500 million users. One of the cooler Android 8 features in my opinion is the Autofill API. It can be used to automatically fill out forms in apps, as well as automatically fill out or read out websites and save the contents. This makes password management child's play. Google of course offers itself as an autofill service. Samsung, on the other hand, relies on its own in-house service Samsung Pass. It stores all your passwords on Samsung and synchronizes them to your other devices with the same passport account. Too bad that the server was not reachable on the day of the Oreo update. Screenshots were not allowed in the app. Nonetheless, you still have the option to choose LastPass Beta or Google for autofill services. 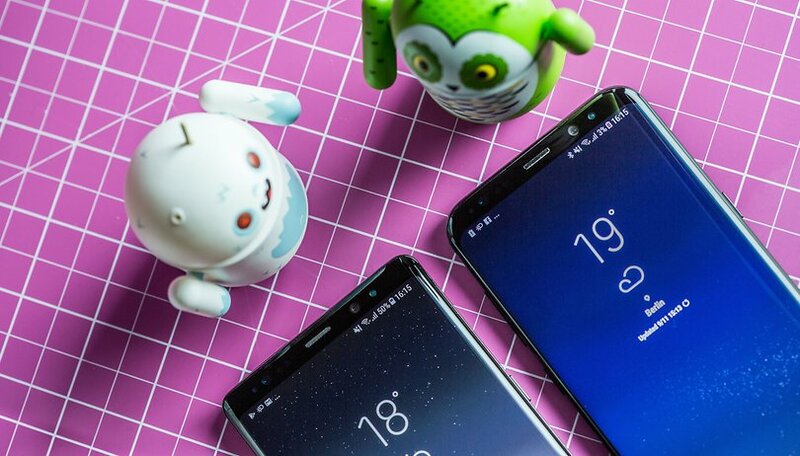 Coming from Nokia, Motorola or other devices with comparatively unchanged Android, Samsung's insistence on its own services is clearly noticeable. Samsung users are encouraged to forgo Google's services and instead rely on Samsung services like Samsung Cloud, Samsung Connect or, as mentioned above, Samsung Pass. I think it's nice that Samsung offers alternatives to Google, since Google isn't exactly known for its respect for our privacy. But the fact that I couldn't log in to Samsung Pass while testing shows the risk: What if Samsung suddenly stops providing these services to focus on the core business? The thought makes me nervous about relying on Samsung's back-up function. McAffee, Microsoft, Facebook and The Weather Channel seem to be good friends of Samsung. Almost unique to Samsung devices are the fact that apps from these vendors are pre-installed and sometimes cannot be completely uninstalled. The Samsung Experience 9 even has an optimizer in its program—realized in part by the infamous software company Cheetah Mobile. I am especially skeptical about the security app and the optimizer. I consider such apps to be completely useless and never install them on my smartphone. On the other hand,"anti-virus" apps and "booster" apps are successful in the Play Store, i. e. in demand. Samsung apparently prevents us from being tempted by these often useless apps by getting in there first: To prevent users from installing crapware from the Play Store, Samsung simply pre-installs its own corresponding bloatware. Samsung's menus are super crowded for my taste. At the end of each settings page there is a box with cross-references to other areas in the settings. This avoids duplication and helps you to find your way around the maze. However, the level of detail of the settings is considerable. There you can set a lot of things that are overlooked by other manufacturers. You can turn the phone around to mute a call instead of rejecting it. You can use Smart Stay to leave the display on for as long as you read. You can fix the volume rocker to control media playback. Multi-Window and screenshots will work better than with regular Android thanks to the advanced onboard features. Samsung has managed to both worsen and improve Android at the same time. The much more sophisticated variety of options was kept reasonably easy to navigate by the ingenious cross-references. The additional features are almost always useful or easy to deactivate. But then there's the bloatware and the enormous cloud redundancy that makes me feel patronized. I don't want a useless booster or a security suite. I want to keep as little background noise as possible and control the resources of my expensive smartphone. Samsung anticipates too many important decisions here. Samsung doesn't seem to trust its users very much. So the advantage of the many options in the settings is, as far as I'm concerned, smothered by the distasteful bloatware. Too bad, because many of the options are really clever. Have you received the update to your device? What do you think of Samsung's take on the Android experience? Did the Samsung S8 update and now my phone drops out completely during a conversation. Never liked the Oreo biscuits and I'm hating the Oreo upgrade. I'm pretty sure I'll be heading away from Samsung at my next phone change. Updated my S8 can't set, text messaging tones to my contacts, just one tone for all! Help! They aren't *options* if you can't uninstall them. Don't get me wrong I love Samsung, just hate the bloatware. Sounds like Samsung isn't your cup of tea. What you see as bloat others may see as options.